I left Charles to fend for himself this evening and he created some delicious chicken. A mix of spice and herbs for a tasty blackened style chicken. Traditionally blackened dishes are cooked in a dry skillet; but we like to use some oil to keep the smoke to a minimum and create a better sear to the meat; plus I think the flavor is so much better this way. Combine spices and season the chicken breasts well; Charles used 3 pieces of chicken for this amount of seasoning. Heat oil over medium to medium high heat in large skillet. Cook chicken for 5 – 7 minutes each side or until cooked through. We decided on tuna today for lunch; we tend to eat quite a bit of fish. I don’t think I could ever get bored with fish, there are so many kinds and so many different ways to prepare. 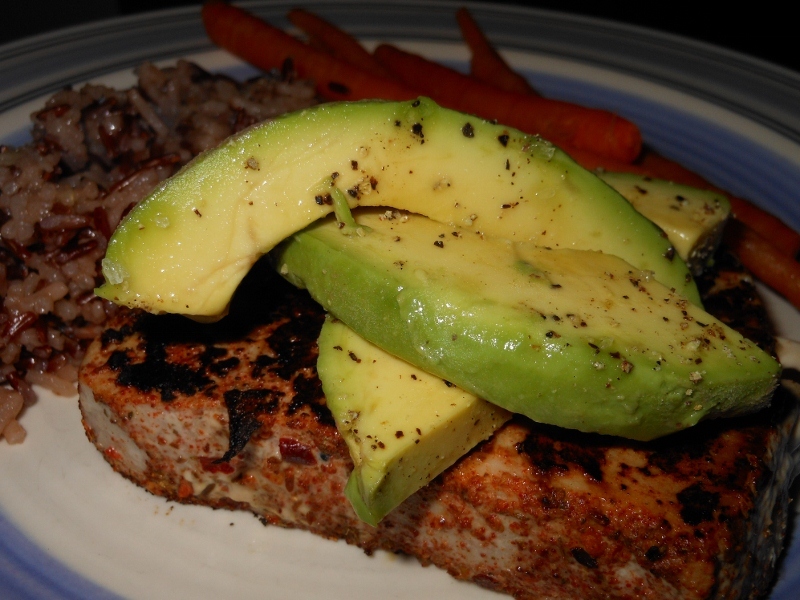 A few weeks ago Charles had picked up a piece of Tuna and on a whim I blackened it while we were preparing dinner. It was one of those Monday’s that we start cooking and maybe 4 or 5 hours later we finally eat so the snack was much appreciated. In any case I used my homemade chili powder for the seasoning. I’ll post the recipe for my chili powder soon; I came up with it one day while making chili only to find out I was chili powder-less and too lazy to go to the store. Ok, back to today’s lunch. Here is where I wish I had a good cast iron skillet. I used my favorite non-stick and heated over medium-high heat. 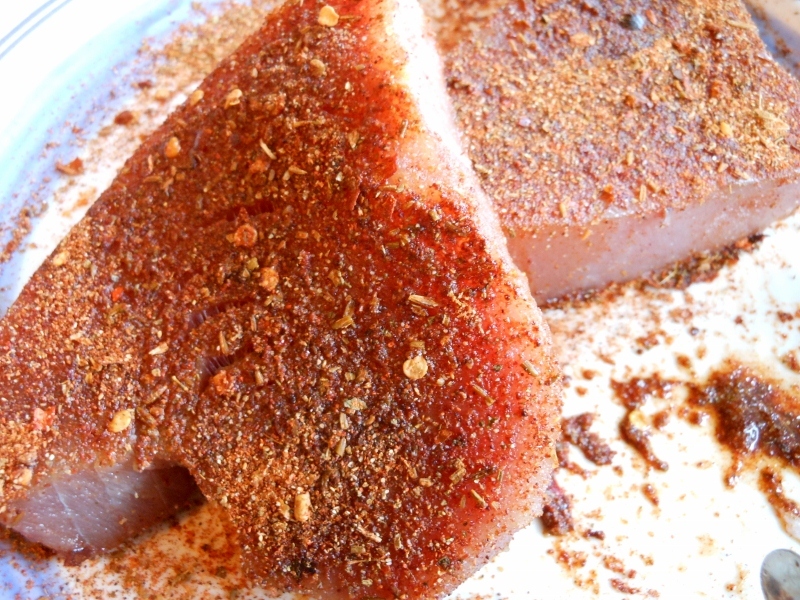 Meanwhile season the tuna with your blackening seasoning of choice on both sides. 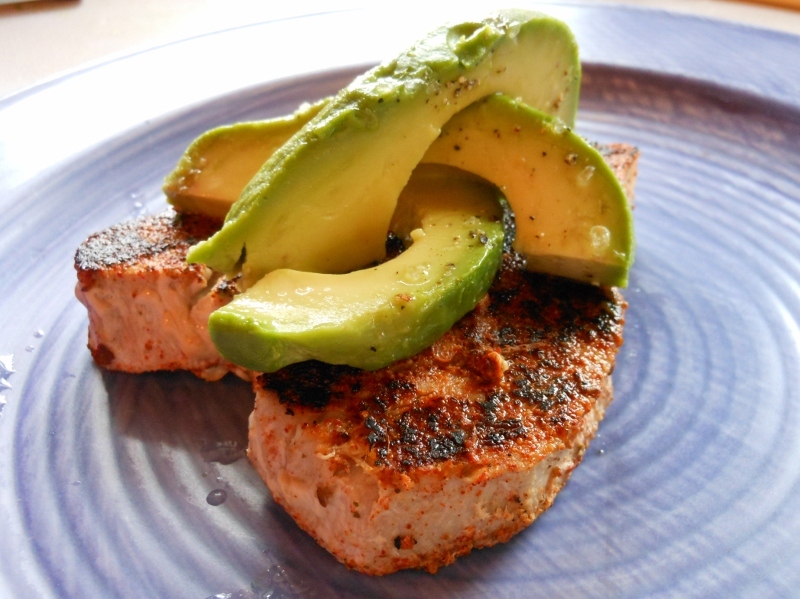 Place seasoned tuna in hot skillet and sear for 3 minutes on first side. It will smoke so have a fan on and a window open if possible. Flip and cook another 2 – 2 1/2 minutes. Remove from heat and set on plate with another plate inverted over top; allow to rest while you prepare the avocado. Cut avocado in half and remove pit. Slice into 1/4 inch slices and remove from skin. Sprinkle with salt and pepper and juice from 1/2 lime. Uncover tuna and squeeze remaining half lime over pieces. 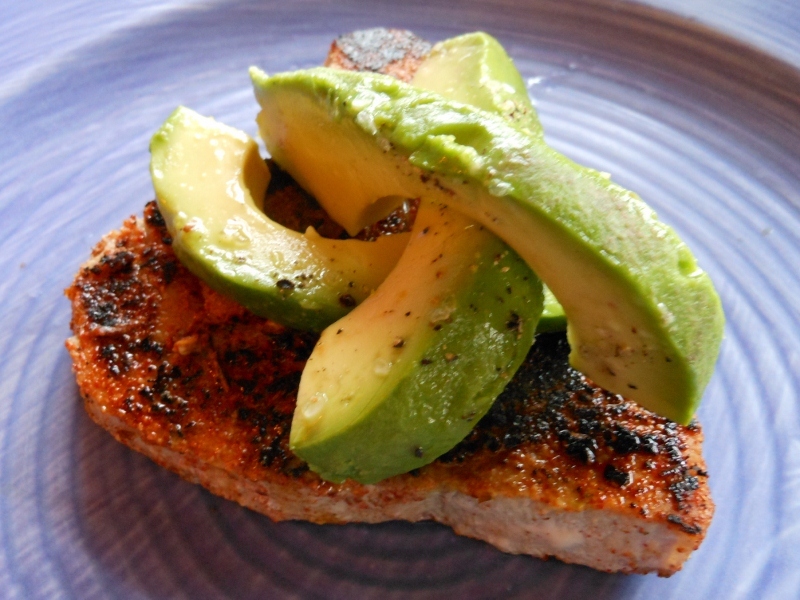 Top with avocado and serve. Just wanted to follow-up with a revisit. I made this again for dinner …. backed the time down to 2 minutes each side to keep the tuna cooked to medium. Enjoyed with carrots and rice; very delicious once again.